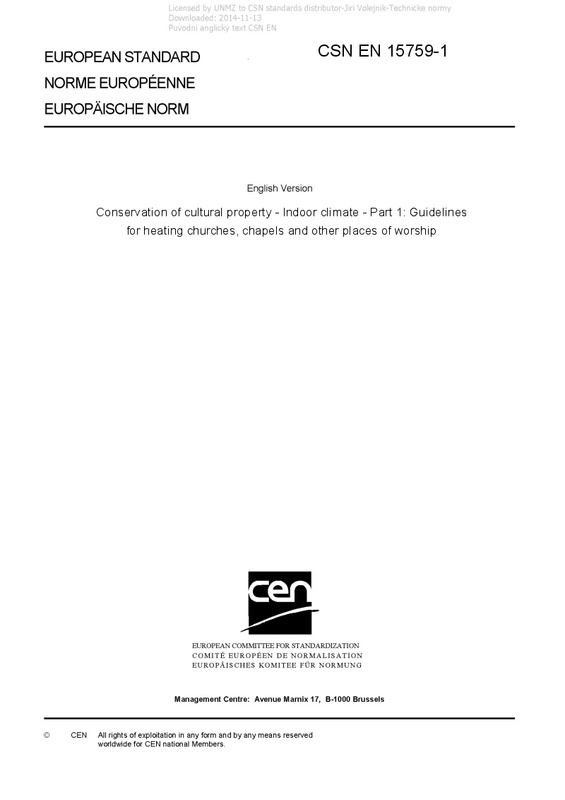 EN 15759-1 Conservation of cultural property - Indoor climate - Part 1: Guidelines for heating churches, chapels and other places of worship - This European Standard provides guidelines for the selection of heating strategies and heating systems in churches, chapels and other places of worship such as mosques and synagogues, in order to prevent damage to cultural property while at the same time creating an indoor climate that allows for a sustainable use of these buildings. It applies to most kinds of places of worship regardless of size and construction. This European Standard applies not only to the introduction of new heating systems but also to the replacement of old ones. This European Standard applies to buildings that are part of cultural heritage or that house cultural heritage objects. This European Standard deals with indoor climate conditions, heating strategies and technical solutions for their implementation but not with the technical equipment itself.